Play From Dusk Till Dawn™ online for free now! Travel to the borders of Mexico, the legendary setting of From Dusk Till Dawn™, where you can rake it in big time in a 5x4 reels slot with 50 win lines. Raunchy Twist performance in the neon-lit bar? You bet! Thrilling winning showdowns? Definitely! Loosen up your finger at the Start Button and enjoy free games and copious Mini Bonus Games! 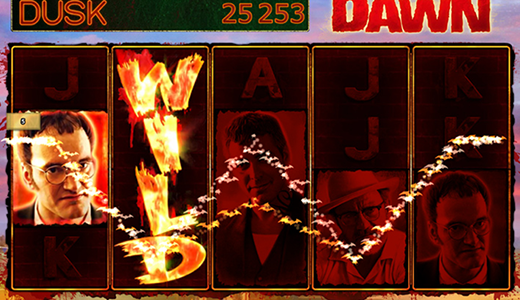 The aim of From Dusk Till Dawn™ is to land 5 matching symbols side by side starting on the left along 50 win lines in total. Scatter symbols count towards a win, regardless of where the win lines run. The Wild symbol substitutes for all symbols except Scatter and can complete your winning combos. The Scatter symbol triggers the Bonus Twister Wheel when 3 Scatters land anywhere on the screen. Put the pedal to the metal! Your getaway car can appear after each spin, speed across the screen and turn a random number of symbols into Wild symbols. You receive winnings as soon as the dust settles and all Wild symbols have stopped. Super cool spins! During the basic game each Richie, Kate or Jacob symbol can randomly turn into a Seth symbol. Get down! If your win is equivalent to your total stakes or higher there is an acute risk of explosion – with a little luck things blow up and your win is multiplied by x5 or x25. Just one more thing about the ticking winning bomb: Unfortunately jackpot wins are blast-proof. 3 Scatter symbols trigger the Bonus Twister Wheel. With a spin you can earn Twists, the Dancing Wild or the Mugshot Bonus. The Bonus Wheel stops at a certain amount: You win this amount, each figure on the Wheel increases and you can spin again. The Bonus Wheel stops at "Pick a Bonus": You can choose between Dancing Bonus or Mugshot Bonus. The feature finishes after a Pick a Bonus has been selected or you have landed 3 wins in a row. You won't be able to take your eyes off her. And the free games are also not to be sniffed at. The Dancing Bonus grants you 10 free games with Santanico Pandemonium acting as Dancing Wild symbol. Dancing Wild: Santanico Pandemonium can alter her size and position with each spin and cover between 2 and 12 symbols on the 3 middle reels – she substitutes for all other symbols. Xtra Stack Feature: If flames are blazing on reel 1 and 5, they turn into Xtra Stacks that show the same symbol in each position. Seize them! With this Bonus you win 3 free games for starters. One of each of the following symbols can appear on 15 single reels: Seth, Richie, Change, Level up. Each new Richie or Seth wins and is held in his position for the remainder of the free games. Moreover, your free game counter is set to 3 again. If a Change symbol lands all frozen Richies turn into Seth symbols. A Level up symbol increases all winnings with frozen Seth or Richie symbols for this Bonus. You can improve your win level up to 4x. The Mugshot Bonus ends if you have either played each free game or filled the entire screen. In that case you earn the Full Screen Bonus as well: 5,000x your bet per line! All wins are determined at the end of the Bonus. 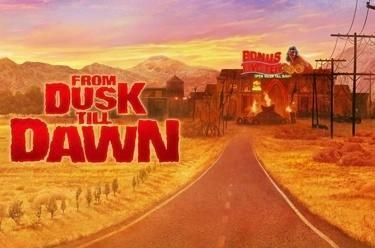 From Dusk Till Dawn™ features 2 jackpots: Dusk jackpot and Dawn jackpot. A portion of each bet goes straight into both jackpots. The higher the total bet the faster you push the jackpot into the hot phase! If you crack the jackpot you receive the jackpot amount as well as your current Scatter and line wins. Further information can be found in the game's paytable. You've watched the movie, and now it's time to get cracking with the game: the life of the Gecko Brothers in the loopiest tavern of all time! 50 lines, groovy animations and raunchy performances during the Bonus games – in this watering hole tough Twist wins are served and badass gamblers take center stage! Will you make it through the night? We are sure of it and you will also take down plenty of Twists. Lend Seth and his brother Richie a hand doing a runner and you will bag more than you could ever imagine!